The skywatchers sky, max 102 Maksutov-Cassegrain telescope is typical of most people's idea of a small grab and go instrument. Like the vixen is also ideal for planetary work, and with its large aperture opens up the sky quite nicely. The downside is that this type of telescope is a lack of contrast, compared to refractor and a larger sizes, they can get quite heavy. A full review will appear shortly elsewhere on this website. Catadioptrics use a combination of mirrors and lenses to fold the optics and form the image. There are two popular designs: the Schmidt-Cassegrain and the Maksutov-Cassegrain. In the Schmidt-Cassegrain the light enters through a thin aspheric Schmidt correcting lens, it then strikes the spherical primary mirror which reflects the light out an opening in the rear of the instrument where the image is formed at the eyepiece. Catadioptrics are the most popular type of instrument, with the most modern design, marketed throughout the world in 3.5" and larger apertures. Best all-round, all-purpose telescope design. Combines the optical advantages of both lenses and mirrors while canceling their disadvantages. 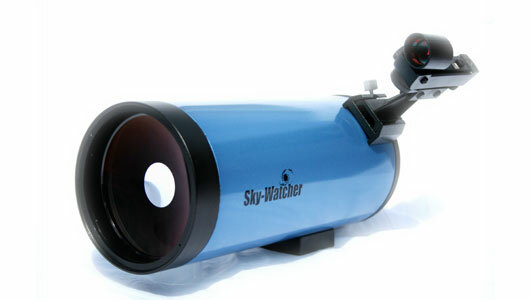 Excellent for deep sky observing or astrophotography with fast films. Large apertures at reasonable prices and less expensive than equivalent aperture reflectors. More accessories available than with other types of telescope. Best near focus capability of any type of telescope. The Maksutov-Cassegrain design is similar to the Schmidt with basically the same advantages and disadvantages but is not quite as good optically given the same focal ratios. It uses a thick meniscus correcting lens with a heavy curvature and a secondary mirror that is usually an aluminized spot on the corrector. The Maksutov is heavier than the Schmidt and because of the thick correcting lens takes a long time to reach thermal stability at night in larger apertures (over 90mm). At 150mm it's not that portable. The Maksutov optical design typically is easier to make and should be less expensive than the Schmidt-Cassegrain. In summary For planetary and starting astrophotography then these are still excellent. Their long focal lengths require some adaptation fro decent astrophotography and are not so good for deep sky visual work below 8" diameter. If you wish for the ultimate planetary telescope, and also a scope which is virtually maintenance free then look no further than a refractor or a Catadioptric.